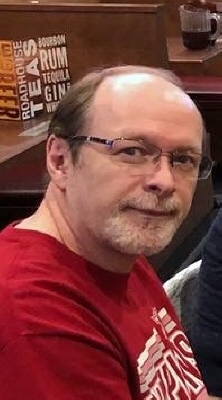 Bradley William Bartman, resident of Sand Springs, passed away on Sunday, November 10th, 2019, at 55 years old. He had been fighting amyotrophic lateral sclerosis, otherwise known as ALS or Lou Gehrig's disease, for about 2 1/2 years before he died peacefully in his sleep. Carla (his wife and my mom), Hunter (my fiance), and I were all present at home when he passed. My dad was passionate about the well-being of people and animals, and likewise, people were passionate about him. He loved sports, especially OU football. He loved dogs and (eventually) cats, too. He ran marathons and played basketball with the neighborhood. He built RC cars. He celebrated Christmas with so many lights, the tree nearly fell over. He loved gothic horror and video games like Baldur's Gate: Dark Alliance and Ghosts 'n Goblins. He planted roses every year he could. He was even more than all of these things. Most of all, he loved mom and me. Dad always made sure we knew he loved us. Thank you to everyone who touched his life on this journey. He was always so happy to see a message from family and friends. We will share any updates regarding services as we move forward. Right now, we're doing our best to remember what dad meant to us. The family requests memorials in Brad’s name be made to either one of these organizations that Brad held dear. ALS Patient Services Outreach (APSO), 918-595-5758; www.alspatientservices.com; 12977 S. 200th East Ave. Broken Arrow, OK 74014 or Humane Society of Tulsa, 918-495-3647; www.tulsapets.com; 6232 E. 60th Street, Tulsa, OK 74135. To send flowers or a remembrance gift to the family of Bradley William Bartman, please visit our Tribute Store. 12977 S. 200th East Ave.
"Email Address" would like to share the life celebration of Bradley William Bartman. Click on the "link" to go to share a favorite memory or leave a condolence message for the family.